This is the sixth in a series of blog posts describing my experiences as part of the 2011 Keizai Koho Center Fellowship Program. One Japanese food dish from the my recent trip to Japan deserves its own blog post – Okonomiyaki. Wikipedia describes okonomiyaki as “a Japanese savory pancake containing a variety of ingredients and is derived from the word ‘okonomi’ : what you want and ‘yaki’ : grilled”. My host family prepared it for me during my home stay and then we visited a restaurant as a group where we prepared one for ourselves on a hot plate which sat in front of us. The okonomiyaki is a mixture of batter, cabbage, pork and optional items including squid, octopus and cheese. On top of this combination are placed noodles, a fried egg, okonomiyaki sauce and mayo. My host family also sprinkled the finished plate with dried tuna shavings and dried seaweed. The dish is most popular in the Kansai and Hiroshima areas. Different regions have different proportions of ingredients. The mixture is fried on a hot plate and turned over several times like a pancake with spatulas. It was relatively easy to eat with chopsticks and has so many ingredients it is easy to find something that everyone likes. This is the fifth in a series of blog posts describing my experiences as part of the 2011 Keizai Koho Center Fellowship Program. 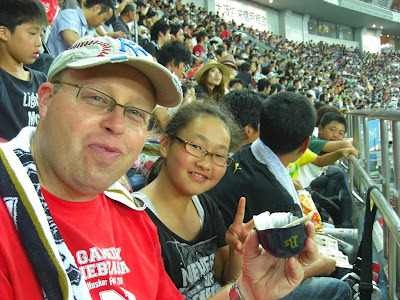 One of the things I hoped to have an opportunity to do while in Japan was watch a major league Japanese baseball game. This ultimately was a reality because of the generosity of my host family. A week prior to visiting Japan my host family contacted me to see what I would like to do during my homestay in Japan. 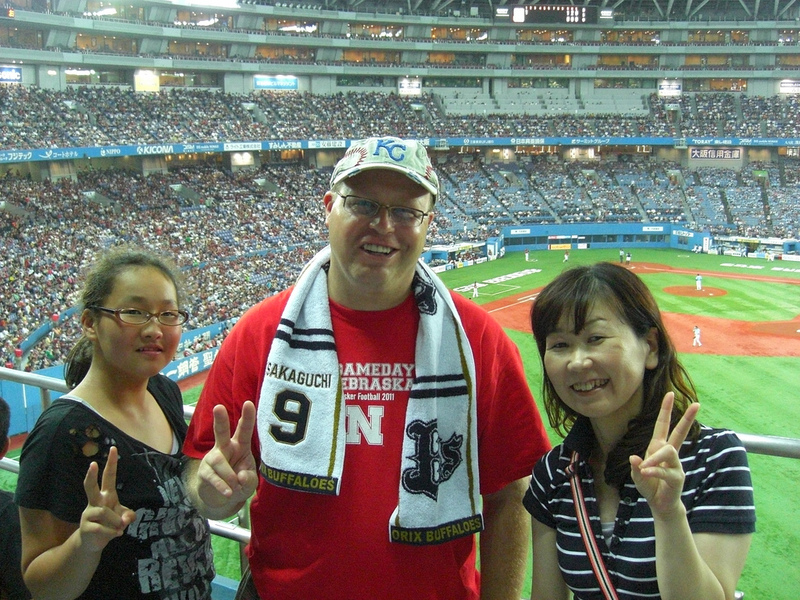 I replied to Noriko, my host, and explained that if possible I would love to attend a game. She said it would be possible to attend a game on July 3rd at Osaka. Noriko, Mizuki (Noriko’s niece) and I took a combination of subways and trains from Kyoto to Osaka to watch the Osaka Orix Buffaloes and the Fukuoka SoftBank Hawks play at the Kyocera Osaka Dome. The teams in Japan are sponsored by companies and the corporate names are included in the name of the team – Orix sponsors the Osaka team and SoftBank sponsors the Fukuoka team. The Osaka Orix Buffaloes are the team Ichiro Suzuki played for in Japan before coming to the United States to become an All-Star with the Seattle Marines. Ichiro is one of my favorite players to watch and there were a ton of advertisements in the stadium featuring him promoting a Japanese brand of beer. We arrived at the Osaka Dome looking to get tickets for the game. We wanted to get some cheap tickets so we went to the area of the stadium where the general admission seats are sold for the game. We were just walking up to the ticket booth to buy some tickets, which cost about 1,500 yen each, when a family approached us and asked if we were looking to buy tickets. Noriko explained that we did want to buy some tickets. The family explained they had some extra tickets since their friend was unable to make it today. He offered to sell us two tickets for 1,000 yen – about $8 in U.S. currency. We agreed and then when he saw we needed a total of three tickets he gave us the third one for free and then handed me the jersey the team was giving away that day. I was so thrilled to get the tickets and the free jersey that I told him thanks in Japanese repeatedly and asked to take a picture with his family. We were in! We entered the stadium and found it to be very much like any domed stadium in the United States – fans milling around, concession stands and places to buy souvenirs. 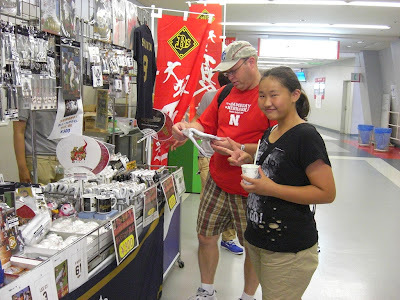 I went to the souvenir stand to get some items to take home. I saw many fans walking around with a large towel they wore around their neck which had the team name and featured the name and number of their favorite player. I decided I needed one of these so I bought one with the name of my new adopted favorite player in Japan – #9 Tomotaka Sakaguchi of the Osaka Buffaloes. I also found a team autographed baseball with Sakaguchi’s signature. I also picked up a couple of game programs for free. The programs were really cool and even gave directions for specific team songs and chants as well as directions for waving your towel in a certain manner. The concourse was full of food options included a hot dog stand, traditional Japanese cuisine (including octopus and sushi), a Kentucky Fried Chicken and a McDonald’s. I had not yet tried a burger at a McDonald’s in Japan and the other options didn’t appeal to me so I decided this was the time to do a taste comparison. I got a Big Mac, fries and a Coke. The Big Mac tasted pretty close the same as in the states with the exception of maybe a little more pepper on the patty. My hosts also got burgers at McDonald’s. We reached our seats, the first row of the upper deck of the Osaka Stadium just to the left of center field. It was much like an American game except for the dressed up samurai warriors running around the field and the chanting from the fans. The fans for the opponent were louder than their home counterparts. They had a band with drums and trumpets while waving several very large team flags. The fans also did a unique celebration using different colored balloons. At the end of the 6th inning half of the stadium blew up large yellow balloons and then between innings on cue half of the stadium let them go, causing them to fly in the air a short distance and then fall to the ground. The action was repeated in the middle of the 7th with the opposite side of the stadium doing the same thing with pink balloons. I had never seen anything like it at an American stadium. The game was a defensive battle with the score at 1-0 in favor of Osaka when we had to leave in the 8th inning to catch the train back to Kyoto in time. The game itself wasn’t really all that different than one in the states with the exception of a more bunt attempts. 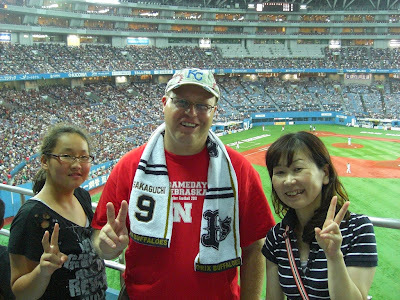 Each team had a couple of American players each and the starting pitcher for Osaka was an American. It was fun day at the ballpark and I’m glad that I can say that I was able to attend a game in Japan and I have a new favorite player to follow in Japan. This is the fourth in a series of blog posts describing my experiences as part of the 2011 Keizai Koho Center Fellowship Program. I must admit that I was astounded by the sheer number of people in the city of Tokyo. Those of you who know me well know that I grew up in Howells, Nebraska - a small farming village in northeast Nebraska with an official 2000 census population of 632 people. We stayed in Tokyo on this fellowship for a total of four nights. Tokyo is the world's most populated metropolitan area with a total of 35 million people. It was hard for me to get a grasp of what 35 million people look like until I open the window to my hotel room at the Tokyo Dome Hotel. My room was on the 20th floor (the hotel has an observation lounge on the 45th floor). It was about 11:00 PM at night when we got into our hotel room and when I opened the window I could see nothing but lights from skyscrapers in every direction. The site was amazing and even more so considering that many buildings in the Tokyo area are not fully lit at night due to the efforts to conserve energy following the disaster at the Fukushima nuclear plant in the 3/11/11 earthquake. The next morning I looked out over the city in the dawn of the morning light and it was even more impressive than the evening before. It was now daylight and in every direction not only could I see buildings, but skyscrapers in every direction going on forever on the horizon. It was very impressive. I took some pictures of the Tokyo skyline from my hotel window but also ventured to higher locations including the 45th floor of the Tokyo Ritz-Carlton hotel and the 40th floor of the Tokyo Dome Hotel and took pictures and video from these locations. The sheer number of people of in Tokyo is almost too much to comprehend. The urban core of Tokyo has 2,700 square miles with a population density of 12, 296 people per square mile. I was impressed. This is the third in a series of blog posts describing my experiences as part of the 2011 Keizai Koho Center Fellowship Program. For some reasons I was fascinated with the number and quality of the vending machines in Japan. Vending machines were everywhere and they had tons of choices. Some vending machines for beverages had almost 40 choices. I admittedly drink too much soda – Diet Pepsi is my vice at home – and so I would occasionally use the vending machines to get my daily caffeine fix. I never saw Diet Pepsi but they did have Pepsi Max and Pepsi Dry in the Japanese market. I tried the special Pepsi Max but it had a different taste than the same product in the states and I generally drank Coca-Cola since it was more readily available. The restaurants also often had Coke and my host family bought Coke in advance of my home stay because they had once hosted some American students and they drank a lot of Coke while visiting their house. Since it was extremely hot during our stay in Japan I would sometimes stop at a vending machine to purchase something to drink. I tried some of the fruit juices and thought they were pretty good. My favorite new drink that I discovered was milk tea. This drink, as stated, is a mix of milk and tea - sort of like buying a Starbucks Frappuccino at a convenience mark mart in a bottle but with less kick. It was a great drink to cool down when I didn’t want a soda. I drank milk tea quite a bit while in Japan and hope to find it somewhere in the states for a treat. We also did see a number of vending machines selling food items, ice cream, newspapers and cigarettes. It was also surprising to see that you could buy beer and even sake in a vending machine. I can’t imagine a vending machine in the states that would sell alcohol. This is the second in a series of blog posts describing my experiences as part of the 2011 Keizai Koho Center Fellowship Program. My journey to Japan literally included a variety of trains, planes and automobiles (in addition to subways, buses and ferries). The first leg of my journey was delayed when my flight from San Francisco to Osaka was canceled due to mechanical issues. I was put up in a hotel in San Francisco for the night and my new flight plan now included flying to Tokyo instead and then a connecting flight into Osaka. This new itinerary concerned me a little since I would be flying into one of the world’s largest airports where I did speak the language, had to clear customs immigration and customs within an hour to make my connecting flight. I was more relieved when I discovered that one of the other teachers in our group would be on the same flight and we would be attempting to make this connection together. Our flight sat at the gate an extra hour and a half at San Francisco with an issue loading the luggage so it really made it difficult once we landed in Tokyo. Our connecting flight to Osaka from Tokyo was on Japan Airlines and the staff at the airport did an amazing job of helping us get through immigration, collecting our luggage, clearing customs and then finally making our flight with about 2 minutes to spare. We did have to run through the airport but we made it. The flight on Japan Airlines was smooth and uneventful. The most memorable aspect of the flight was how clean the airline was and the way the flight attendants checked on us about 5 times during the hour long flight. During our excursions in the city we often traveled by a chartered bus but we also used taxis. Several times while traveling in taxis I sat in the front seat on the left side, opposite of how we drive in the United States. I sometimes caught myself catching my breath as we made some quick turns in traffic unto what appeared to be the wrong lane. The subways in Kyoto, Osaka and Tokyo were always clean and on time. Tokyo had the busiest subways by far but nothing that we couldn’t handle and everyone was very respectful when the cars became full. Whenever we had a question about which train to take the individuals we asked were always very gracious and helpful. The program gave us a credit card preloaded with enough yen so we could use it throughout our stay and not worry about buying individual tickets each time. All we had to do was hold it up to the sensor and then pass through the gate – very smooth. My favorite mode of transportation in Japan was by far the bullet train – or as it is called in Japan, the “Shinkansen”. I knew we would be traveling on the bullet train because it appeared on our initial itinerary and it was one of the things I was most excited about experiencing while in Japan. I can remember reading about the bullet train when I was a kid growing up and thinking it would be an awesome way to travel. We rode the bullet train twice – one from Kyoto to Hiroshima and then later from Hiroshima to Tokyo. The first trip – Kyoto to Hiroshima – was about 2 hours long. It was still light when I started so we could see cities and the countryside as we zoomed along at roughly 170 miles per hour. The tour organizer had arranged an upgrade for us to the first class car, known as the “green car”. The seats were spacious and comfortable. Each seat had its own power outlet to accommodate a laptop. Attendants came through the car offering to sell beverages or snacks. It was a very comfortable trip. The second trip – from Hiroshima to Tokyo – was roughly 4 hours. Again, we started in daylight and then it gradually got darker as night fell. Since it was dark we did not see Mt. Fuji on this trip. We didn’t score the green car this time but the regular class tickets still offered many of the same services and the seats were just a tad smaller but still very comfortable. We grabbed a bento box and headed for Tokyo. The bullet train made several stops along the way but each one lasted only a couple of minutes. The bullet train is always exactly on time and gives you a couple of minutes to board at each stop before zipping on to the next destination. A study done in 2003 showed that in over 160,000 train trips the average arrival time of each train was within 6 seconds of its scheduled stop. I also found it amazing that in its 45 year history transporting more than 7 billion passengers there has never been a fatality due to derailments or collisions! During our time in Japan we utilized public transportation often and found it easy, relatively cheap on consistently on time. It made me wish that I lived in a city where I could get on a subway or train and head down to the baseball game or a visit to a museum. Overall I was very impressed with transportation in Japan and found it to be enjoyable. This is the first in a series of blog posts describing my experiences as part of the 2011 Keizai Koho Center Fellowship Program. This year I celebrated July 4th outside of the United States for the first time in my life. This year on July 4th I woke up on the 16th floor of a hotel in Hiroshima, Japan while participating in a study tour of Japan from the Keizai Koho Center. I was welcomed to the sight of a bustling Japanese city when I opened the windows of my hotel room in the morning. We had arrived late the night before via the bullet train from Kyoto. On the taxi ride from the train station to the hotel the night before my first impression was the dramatic comparison from Kyoto. The buildings in Hiroshima were much newer and the city looked distinctively modern in comparison to Kyoto. Then the reason for the stark contrast in cities dramatically struck me - this was a relatively new city because on August 6, 1945 an atomic bomb was dropped from the B-29 Bomber Enola Gay and in a matter of minutes had destroyed much of the city. In the previous 24 hours several of us in the group had mentioned in casual conversation that it was it was somewhat unusual that we were celebrating July 4th in a Japanese city with this unfortunate link to our own history. Would the people we would meet in Hiroshima show any resentment toward Americans? So far on our study group we had been the recipients of extraordinary hospitality from the people of Japan but would Hiroshima be different? After breakfast our group set out for the two scheduled appointments on our itinerary. First we were visiting Waseda Jr. High School in Hiroshima. In the afternoon we were visiting the site where the atomic bomb was dropped and the accompanying world peace park and museum. It was a full day, and just as we did for every day on this study tour, we looked forward to the adventure and the exploration. Our bus pulled up to the front of Waseda Jr. High School. We removed our shoes and were asked to follow the principal. It was quiet in the hallway. As we approached the gym, we noticed signs created by the students welcoming us to their school which featured American flags. We entered the gymnasium to see a sight which surprised many in the group. The entire student body of Waseda Junior High was assembled in the gym - absolutely quiet and standing in meticulously straight rows. As we entered the gym, the students were smiling and offered a thunderous round of applause which continued until all of us were seated in designated chairs lined up on the baseline at the far end of the gym. The response from the students was moving to say the least. The students had prepared a welcoming program for us which including greetings, a traditional drum performance and signing. They told us they wanted to help us celebrate the 4th of July since it was an important day for us. I was moved to the brink of tears. Just an hour before at breakfast I had a sense of uncertainty concerning how Americans would be treated in Hiroshima. The actions of the students at Waseda Junior High answered my question and this spirit of hospitality and friendliness was repeated consistently over the course of the next couple of days. The remainder of our school visit was a wonderful experience and our time at the peace park was excellent as well. Each of these visits warrant their own specific blog entry so I will not expand on it at this time. I will also defer discussion on the politics and circumstances which resulted in the atomic bomb being dropped over 65 years ago - all great discussions for a different blog entry. But what I felt in that gym on the morning of July 4th was not about the past, not about a horrific war fought between our grandparents and great grandparents, not about looking at the past. For that one moment in time, for me personally, it was about looking toward the future and an understanding that we have so much to gain from helping and working with each other. I did not spend the 4th of July in the United States this year but I will remember sitting in that gymnasium on July 4th for the rest of my life. Hello. This summer I went on an adventure of a lifetime. I was selected this past spring to participate in the 2011 Keizai Koho Center Fellowship Program. I had the good fortune of traveling in Japan between June 29th and July 8th with nine other social studies teachers from the United States. We visited a variety of cities in Japan including Kyoto, Hiroshima and Tokyo. We toured schools, businesses, historic sites, factories, temples and shrines. We have a home stay with a Japanese family. We ate things we couldn't describe and sang Karaoke in downtown Tokyo for three hours. We met the major of Hiroshima and rode the bullet train. It was an experience I will never forget as well as the people I shared it all with for nearly two weeks. I took a lot of pictures during the trip. It would probably not shock anyone who knows me that I took over 1,100 pictures in 10 days and had my handy Flip Video cam along to collect some of the memories on video. While we were in Japan it was difficult to update the blog and do a quality job of capturing the experience so I have waited until after the trip to really reflect and write. My upcoming posts will include my thoughts on aspects of the trip, mostly organized into themes. I will include accompanying photos and videos. I hope my blog posts will accurately convey some of my experiences on this amazing trip. If you are interesting in participating in a Keizai Koho Fellowship - and I highly recommend it if you have any remote interest in Japan - please check out their website for more information on how to apply for future trips. The second temple we visited today was Rokuon-Ji Temple – also known as The Golden Pavilion because the structure is wooden with gold-leaf on Japanese lacquer. The building is truly stunning as it sits on a pond. This is my favorite temple of the trip and it think the pictures of The Golden Pavilion are my best so far on this trip. The site of the temple was also busy with numerous school groups – hundreds of Japanese students in their school uniforms covered the grounds. We talked with several groups of students and they asked us questions to practice their English. Japanese students also requested to have their picture taken with American teachers before we left the site. Our first visit today was to the Ryoanji Temple in Kyoto. This Buddhist temple is famous for it’s rectangular Zen rock garden. As we entered the grounds of the temple we walked through gorgeous landscaping and Kyoyochi Pond with lilies. This pond dates back to the 12th century. The surrounding grounds had trees and flowers. It was incredible and at this time of the summer everything looked great. The rock garden has a gravel base and 15 stones. At first the garden honestly did not impress me. It looked very simple. Our guide then explained that the garden contained exactly 15 stones because the moon becomes new again in 15 days. The aspect of the garden I liked the most was that the stones in the garden are arranged in such a way that it is impossible to stand and view al 15 at one time – symbolizing that it is impossible for anyone to be perfect. The temple itself was also very impressive. We took off our shoes off upon entering the temple and one of the teachers in our group had a great comment as we left. He said that without wearing shoes it was possible to interact more with the temple itself – feeling it with your feet. I thought that was a great observation.